We are proud to announce that Denel Land Systems has done it again! Every year companies from all over the continent convene to celebrate the procurement profession and procurement projects making a difference in Africa. This year the Pan African Awards took place at the Premier Hotel, OR Tambo International Airport on the 30th of October 2014. Denel Land Systems walked away with the Best Public Sector Procurement & Supply Project of the Year Award for the Hoefyster Project. The focus of the award is on the projects that have yielded improvements, value for money while considering developmental and service delivery goals of Government. 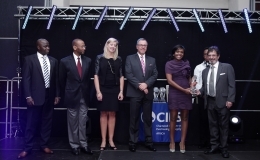 This award is endorsed by the DTI, SOEPF and CIPS Africa.